Virus-bacterium associations were examined in the natural environment of a termite’s hindgut. Researchers from the California Institute of Technology, funded in part by the National Science Foundation, were the first to use a clever technique to look at virus-bacterium interactions in vivo, that is, within an organism’s normal state. The researchers report their results in the July 1st issue of the journal, Science. They were then able to determine whether the chambers contained bacterial DNA, viral DNA or both. 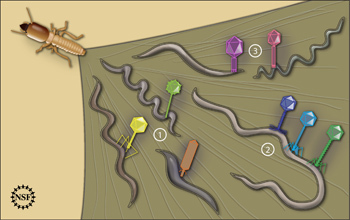 In the latter case, the researchers were able to statistically deduce whether the virus was specifically associated with the host–for example, by attaching to the host, shooting its DNA into the host, being incorporated into the host as a prophage (a viral genome inserted and integrated into the bacterial DNA), riding on a plasmid or by assembling new viruses within the host. And through this snapshot, the group recorded virus-bacterium associations.